California’s great weather makes it a prime spot for cycling. Throughout the state, you’ll find avid cyclists that hit trails and city streets on a regular basis. From environmentally concerned Northern California to the congested freeways of SoCal, you’ll find bike shops that cater to all types of cyclists, from newbies, to the sport, to pros and weekend riders. Check out where to head for help with your ride when things go awry or you’re looking for a new ride. In the town of Sausalito, you’ll find Above Category. 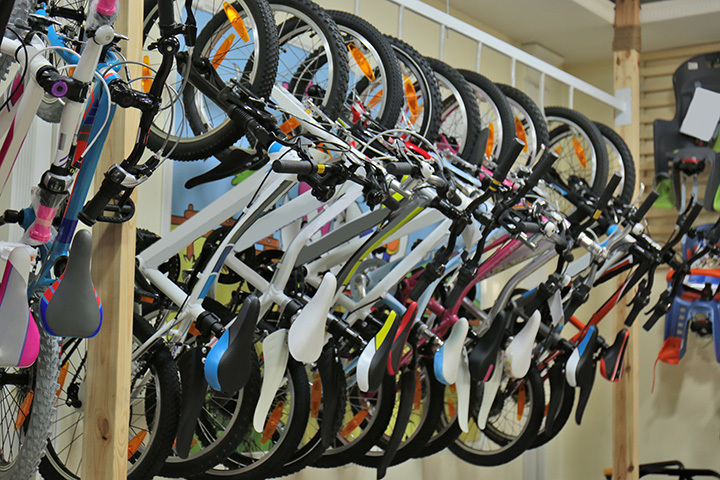 The bike shop is renowned for its high-quality pro riding gear include clothing, bikes, accessories and a knowledgeable staff. Above Category is regularly featured in pro magazines thanks to its vast selection. Despite the hilly streets, San Francisco is a biker’s paradise thanks to Rapha. Rapha is an industrial chic shop that offers a selection of biking apparel along with coffee and artistic visuals of bike races. Rapha pop-up shops can be found in cities all over the world. Sunnyside Bicycles has two locations in California’s Central Valley to get people out and riding. The friendly service takes pride in helping bikers of all levels, from beginners to pros. Pedaler’s Fork is a unique concept that pairs a classic weekend biker stop with a full-service restaurant and bar. There’s also coffee galore and a full scale professional bike shop where you can get your ride repaired, fixed, tinkered with and more. Bike riders love Golden Saddle Cyclery due to the friendly and knowledgeable professionals. From repairs to parts, the bike shop provides affordable deals and quality supplies for riding. The Unlikely Cyclist specializes in getting women out and riding. Many bike shops tend toward the macho so The Unlikely Cyclist caters to women who want to ride but may feel intimidated in many shops. Women of all sizes and biking abilities are encouraged to drop by. Better known as ARB (the acronym for A Road Bike), ARB has been through several name changes in its decade plus history. These days, the remodeled, expanded shop takes pride in having any and all types of bikes—not just those built for roads. You’ll also find maintenance and specialty services. Helen’s Cycles shops can be found in various neighborhoods throughout L.A. so that you can always find a bike, repair or other biking necessity nearby and for an affordable price. They’ve been in business for over 75 years and take pride in integrating the location of each shop into their offerings. Bike Connection is a full-service bike shop that offers not only bikes and repairs but also rentals and apparel. Bike Connection has a Palo Alto and San Francisco location and provides information on rides as well as services and gear that is aimed at female riders. Palm Springs and Palm Desert Cyclery offer money back guarantees and affordable prices and deals on their selection of bikes. You’ll also find gear, accessories, apparel and more at the desert bike shops. If you’re looking for a new bike, you can also try turning in your old one for a special deal.